Reverse Osmosis (RO) water treatment process involves water being forced under pressure ( Osmotic Pressure ) through a semipermeable RO water treatments membrane. In this Reverse Osmosis water treatment process Temporary and permanent hardness, Total Dissolved Solids (TDS), Microorganisms and other bio germs contained in water are captured while the water is passed with high pressure through the Reverse Osmosis water treatment membrane. The Reverse Osmosis water treatment Process is generally used for desalination of Sea water treatment and Brackish Water treatment for its conversion into potable water. In the whole Water Treatments fields Reverse Osmosis water treatment Process usage in Industrial water treatment and Domestic water treatment is huge. Reverse Osmosis water treatment is the main key of modern water treatments field to solve water requirements. 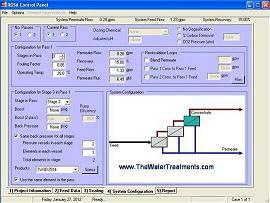 Simple flow diagram of Reverse Osmosis water treatment systems is shown below. The quality of the water produced depends on the pressure, the concentration of salts in the feed water, and the salt permeation constant of the membranes. Product water (permeate) quality can be improved by adding a second pass of membranes, whereby product water from the first pass is fed to the second pass. The water treatments membrane can be defined essentially as a barrier, which separates two phases and restricts transport of various chemicals in a selective manner. A membrane can be homogeneous or heterogeneous, symmetric or asymmetric in structure, solid or liquid, can carry a positive or negative charge or be neutral or bipolar. Transport through a water treatments membrane can be effected by convection or by diffusion of individual molecules, induced by an electric field or concentration, pressure or temperature gradient. In the Water treatment Membrane filtration are categorized according to their pore sizes as micro-filtration, ultra filtration, nano filtration and reverse osmosis. Micro filtration uses the largest pore size, reverse osmosis the smallest. Reverse Osmosis water treatment membranes have pore diameters ranging from 5 to 15 A degree (0.5 nm to 1.5 nm). The extremely small size of Reverse Osmosis water treatments membrane pores allows only the smallest organic molecules and unchanged solutes to pass through the semi-permeable membrane along with the water. The water treatments membrane thickness for reverse osmosis may vary from as small as 100 micron to several millimeters. The first commercially available membranes, developed in the mid 1960s, were made of cellulose acetate (CA) manufactured in flat sheets. Modern Cellulose Acetate membranes are modifications of the cellulose acetate structure, including blends and different surface treatments, and are called cellulose or symmetric water treatments membrane. Non-cellulose water treatments membranes, called thin-film composite membranes, have been developed since the 1970s. 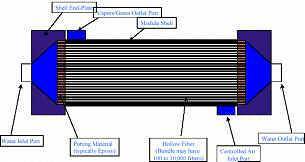 These include poly amide membranes with relatively thick asymmetric poly amide support structures and composite membranes with thin-film poly amide or other membrane materials on a porous support structure. Almost all water treatment Reverse Osmosis membranes are made of polymers, cellulose acetate and poly amide types rated at 96%-99+% salt rejection. Thin film composite (TFC) water treatment membranes. The support material is commonly poly sulfones while the thin film is made from various types of poly amines, poly urea’s, etc. Advantages and Disadvantages of Water treatment Membrane. Each Reverse osmosis water treatment membrane material has advantages and disadvantages. The CA-based Reverse Osmosis water treatment membranes are now generally the least expensive. Use of Cellulose Acetone water treatments membranes generally requires chlorinated feed water and higher operating pressures than those needed by the composite water treatments membranes. Composite of Reverse Osmosis water treatment membranes generally operate over wider pH and temperature ranges than CA membranes. 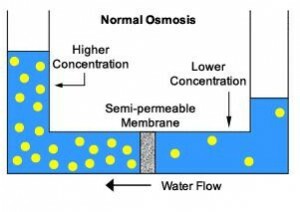 In some cases these operating characteristics of composite Reverse Osmosis water treatment membranes result in savings in electric power and chemical costs. Their greater pH tolerance provides additional advantages in cleaning for some applications. Sensitivity to chlorine and other strong oxidants in the feed water is a disadvantage of poly amide based membranes. In the recent years, hollow-fiber and spiral-wound configurations have become the standard for Reverse Osmosis (RO) water treatment. 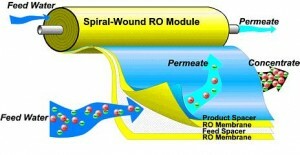 The predominance of the spiral wound configuration has resulted from recent advances in water treatments membrane technology, which has been more easily translated into commercial flat-sheet membranes than into the hollow-fiber configuration.apes and structures, different types of membrane modules are available. The water treatments membrane and module development has lessened the effects of physical compaction and has brought forth spiral membrane modules capable of operating at pressures in excess of 50 bar (50 ksc.2 bar). The techno economic factors for the selection, design and operation of membrane modules include cost of supporting materials and enclosure (pressure vessels), power consumption in pumping and ease of replacing. Reverse Osmosis water treatment can meet most water standards with a single-pass system and the highest standards with a double-pass system. Reverse Osmosis rejects 99.9+% of viruses, bacteria and pyroxenes. Pressure, on the order of 14 to 70 bar, is the driving force of the Reverse Osmosis water treatment purification process. Reverse Osmosis Water Treatment Process is much more energy efficient compared to heat-driven distillation and more efficient than the strong chemicals required for ion exchange. No energy-intensive phase change is required. Pretreatment processes are needed to remove substances that would interfere with the desalting process. Algae and bacteria can grow in both Reverse Osmosis water treatment and distillation water treatment plants, so a biocide usually, less than 1 mg/ L chlorine is required to clean the system. 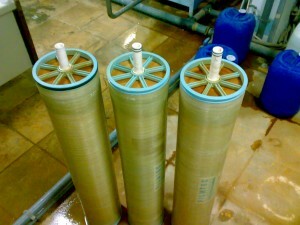 Some Reverse Osmosis water treatment membranes cannot tolerate chlorine, so de chlorination techniques are required to remove the residual chlorine. Ozone or ultraviolet light may also be used to remove marine organisms. If ozone is used, it must be removed with chemicals before reaching the membranes. The type of pretreatment required depends on the feed water characteristics, membrane type, and system design parameters. Pretreatment requirements can be minimal, such as cartridge filtration of well water, or extensive, such as conventional coagulation, sedimentation, and filtration of surface water supply to remove suspended solids. Scale inhibitors such as sodium hexa meta phosphate or proprietary chemicals are also added to reduce carbonate and sulphate scale potential. The pump system raises the pressure of the pretreated feed water to the level required for operation of the desalting system. For Reverse Osmosis water treatment, the pump system discharge pressure typically is about 10 – 30 kg/cm2 for low- TDS and brackish-water systems and 60 to 90 kg/ cm2 for seawater systems. 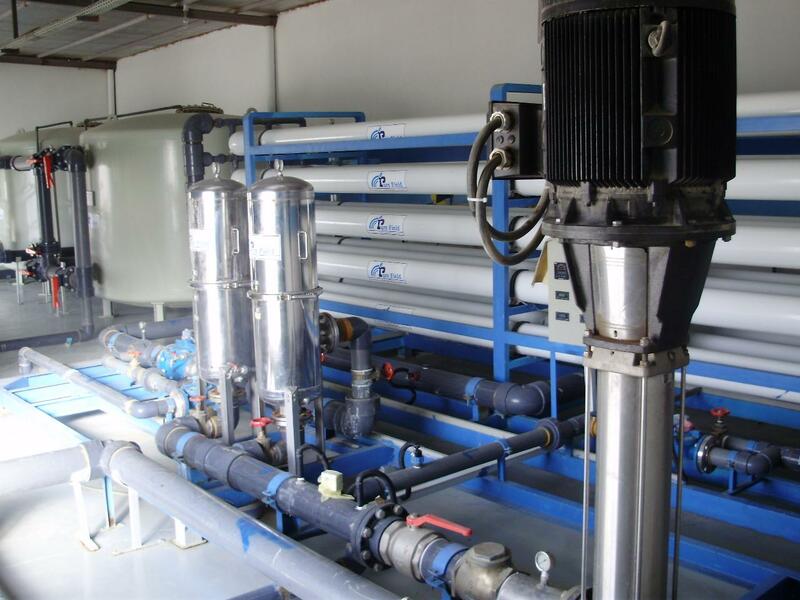 The pump system for Reverse Osmosis water treatment might also include energy recovery devices, particularly for seawater systems. Post Treatment Removal of the gases is normally accomplished by stripping in a forced draft packed column. In the most cases, carbon dioxide must be removed to stabilize the Reverse Osmosis water treatment product water. If hydrogen sulphide is present, degassing of the product water is usually done to control odor and minimize the amount of disinfectant (e.g., chlorine). The final product-water pH is often adjusted by caustic soda, soda ash, or lime. A non-corrosive water can be produced by using these alkaline chemicals and, in some cases, other chemicals and blending with raw or other water supplies that may also feed the distribution system. The filters for pretreatment of feed-water at Reverse Osmosis water treatment plants must be cleaned every few days (back washed) to clear accumulated sand and solids. The Reverse Osmosis water treatment membranes must be cleaned approximately four times a year and must be replaced every three to five years. Reverse Osmosis water treatment plants take up less surface area than distillation plants for the same amount of water production. Koch RO Water Treatment Membrane. Очень хорошая информация о обратного осмоса вода. I found this page via google, and it explains what I was trying to figure out. Thanks! Is it possible to achieve Total Hardness 0.1 ppm? I feel from my calculation’s that 1.1 – 1.14 is the best case. What are your thoughts? Pure Aqua, Inc. manufactures a full line of seawater desalination systems designed for heavy or continuous duty service in the marine applications where quality and dependable performance are keys. I found this page via Google, have been working on operation maintenance on EDR (electro dialysis reversal)for more than 18 years. Which technology better to use Reverse Osmosis or electro dialysis reversal when we need to desalinate water with TDS 4000 ppm.? Easiest way to get pure water. It gave basic enlightenment on the subject.Thank you for the level of content. i am the dealer of aqua grand water purifier for tumkur please send the animated working of reverse osmosis……. I read somewhere that the entire cleaning process takes up to seven years. Is this correct? Technically this is not correct. We cant consider like this for RO chemical cleaning. We have to confirm with water analysis or any pressure drop or fouling. we drained water from our works at temp. around 55 deg C. we are planning to install R.O. Water plant at our works. can this water be utilized. if so, is it beneficial to use water of that temp? if not, what are the other water treatment process where we can use this water? I have heard that RO system wastes big amount of water. Can you tell me or explain if there is any calculation for if drinking water requirement is 5m3.day then what must be the volume of feed water to RO system. As per the Feed water quality we can calculate product water and reject water. Therefore we have to Feed at least 7.5 – 8.5 m3/day. Thanks i got more information about R O Membrane. I prepared my project to my last semester maximum i taken from your site. Water treatment process and sewage treatment process are separately explained. good article regarding water treatment process. I assume you written about water treatment process and designs nice points in features also. I’m so grateful for water treatment process post.Truly looking forward to read much more. Fantastic. really a very good article, its helping me in making a presentation on OSMOTIC ENERGY. A person necessarily lend a hand to make critically posts I might state. That is the first time I frequented your website page and so far? I surprised with the analysis you made to make this particular post amazing. Great activity! relate this .please contact me. Educative article. Is it possible to know the disadvantages of membrane desalination.how is it effective for high saline oil field produced water.